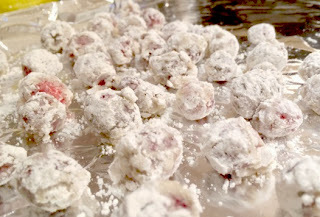 So, my dad asked for candied cranberries. My mom usually makes them this time of year, but I thought I'd try my hand at it. I began with my mom's recipe, but went on to make it my own. *aside-When asked how much powdered sugar, Mom replies, "As much as it takes to get the job done." While this is a yummy version and leaves the cranberries with a sweet, sugary glaze, I really wanted the little snowball effect on them. So, as they were finishing up I decided to change it up a bit.